Through more than a quarter century proudly advocating for U.S. ethanol producers, the one issue that seems impervious to logic and just will not go away is the pernicious food vs. fuel canard. It simmers like a hot ember awaiting Big Oil’s windbags to blow it into a raging fire as their political agenda demands. It resonates among Washington’s elite, who think their food comes from the Safeway and don’t know the difference between sweet corn and No. 2 feed corn. The facts are too difficult to grasp. Make no mistake, despite decades of educating urban policy makers that ethanol simply uses the starch component of corn, and that a very high-value, high-protein feed remains to be consumed by poultry and livestock, the food vs. fuel debate continues to be the single biggest obstacle to the continued growth of the industry. We have to do an even better job of conveying our message. The first accompanying chart emphatically demonstrates what should be the most important message, i.e., oil drives food prices, not corn and not ethanol! Every step of the food supply chain is reliant on petroleum products—from diesel fuel used in farm machinery, natural gas used in food processing plants, plastics used in food packaging, to gasoline or diesel used to transport the food to the restaurant or grocery store. 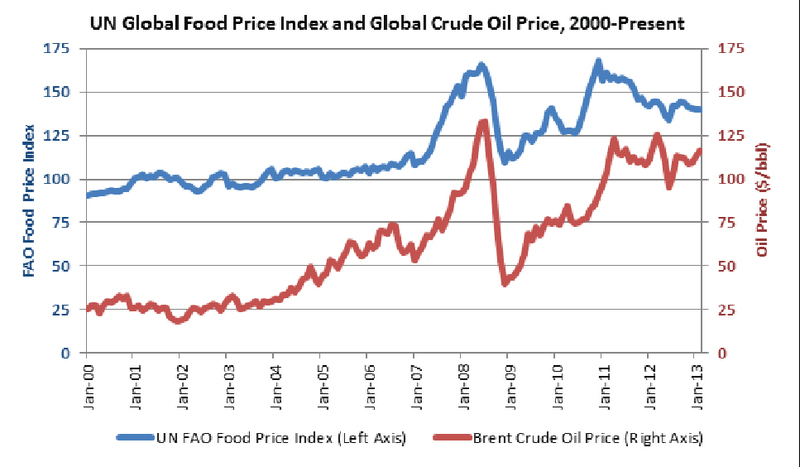 In fact, the correlation coefficient between global food prices and global oil prices since 2000 is 0.92, a near-perfect relationship. 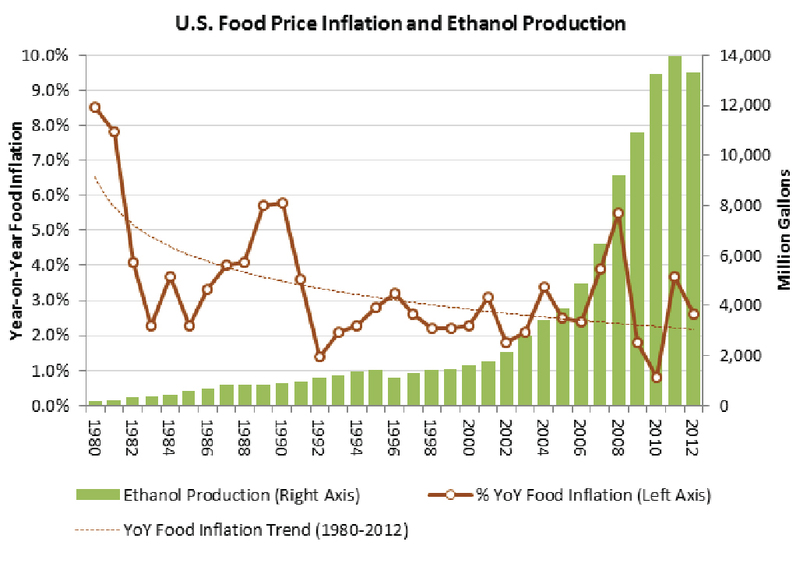 The second chart underscores that, contrary to what our opponents say, food price inflation has been falling while ethanol production has been increasing over the past decade. Food price inflation has been lower (2.9 percent) since the renewable fuel standard (RFS) passed than in the 20 years prior (3.02 percent). And two of the lowest food-inflation rates in the past 50 years have occurred since the passage of RFS2 in 2007. Facts can be nettlesome to our opponents. But facts are the only thing I know to keep the cynics at bay. Use them. Respond to the media and public officials who willingly or unwittingly ignore reality. Do it and we will prevail. And the RFS will be preserved.